Rather than continuing renting a metallic bridge initially built to allow a secondary "route" (Itinéraire Bis), the City decided to provide itself with a superb ecological wooden bridge. 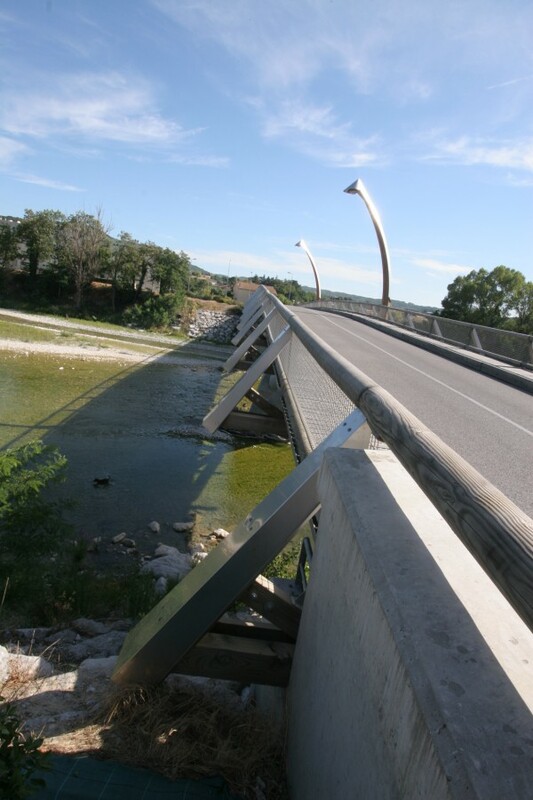 This new bridge is a two-way bridge which can be crossed by vehicles, cyclists and pedestrians. develop the town northward and southward, according to demanding environmental criteria. support the development of the timber industry, wood being a natural resource of the region. This is the first operation of such importance. With its 100 metre-span, it is the longest wooden bridge in France. This innovating conception is the result of a straight partnership between the City and different operators among which the CNDB (National committee for the development of timber), the General Council of Drôme and the Regional Council, the State and the EU. The visitor can appreciate the elegance, the lightness and the technique of this wooden bridge. Budget : 1.5 million €. Among the different solutions given, the proposition made by both the "Atelier de l’Entre" and "Arborescence" was chosen : An open-air wooden bridge with three spans. Total length of the superstructure: 92 metres. 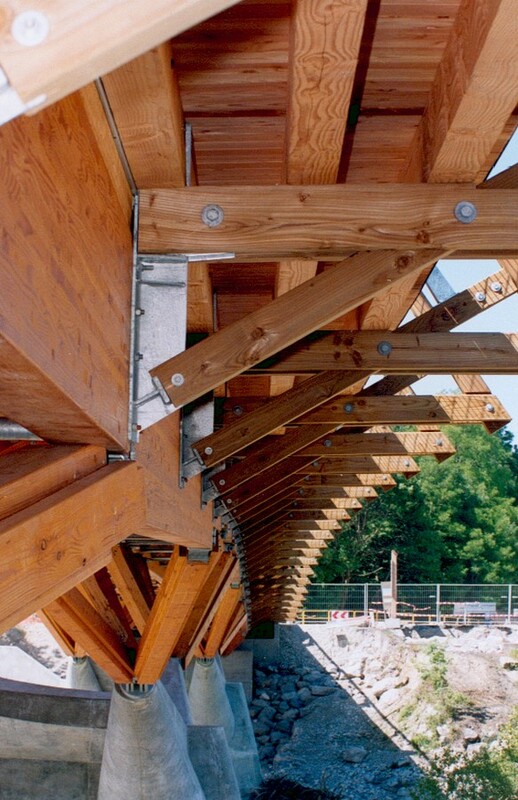 Such a bridge, remarkably integrated in the site, is more respectful of the environment, wood being the only natural and renewable material which can stock carbonic gas. Priority was given to the local wood species from the nearby Rhône-Alpes and Massif Central areas (Oak and Douglas Pine), reducing problems of transportation of materials. The embedding of the pillars respects the flow of the river, so that the bed of the river cannot be over deepened. 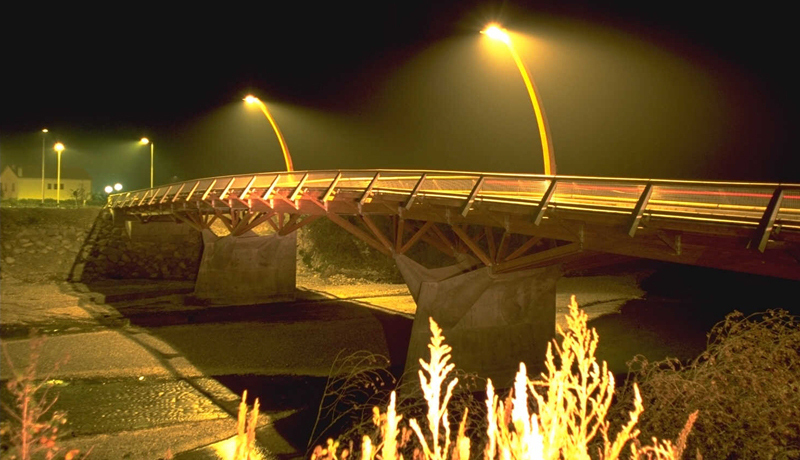 The "Pont en Bois" was opened on 30th June 2001 after a 10-month construction period. The people of Crest are proud of it and visitors are enthusiastic about it. 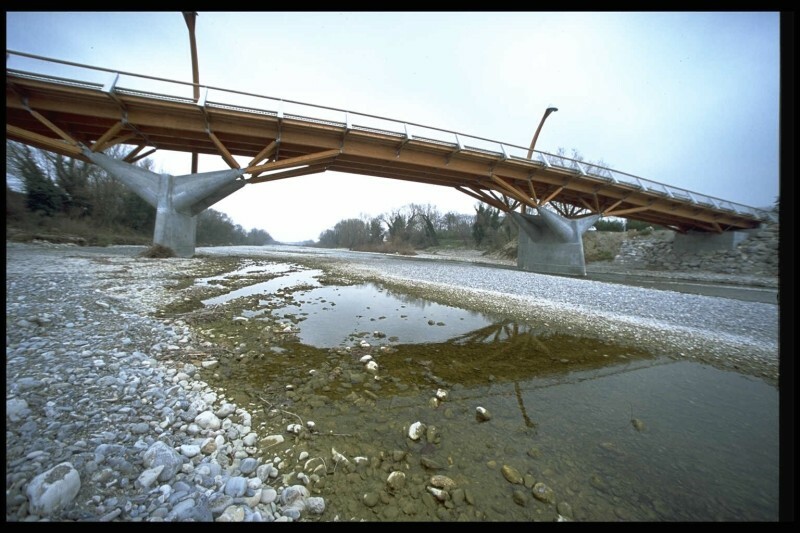 The "Pont en bois" was awarded by both the National Observatory of public innovation (Prix Territoria 2001) and the Ministry of The Territory and Environmental Development (Label: "Merci dit la Planète").